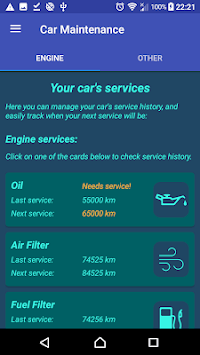 - Car Maintenance is an application which helps you monitor your car's service needs and history, take care of service dues on time and more. What else can this app do? - This application has reminders in it to remind you of tax and insurance or any other responsibilities that need to be remembered. 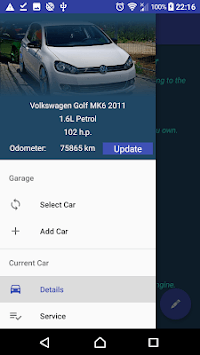 It also has the option to call, locate and navigate to your local workshop with a click of a button. What kind of services can I keep track of? - Everything you need to check and service regularly, like oil, filters, timing belts, battery, tires and more. And also, the things that don't have a service interval, like parts on your car you change over time. I can't find some of the options. -Have you tried long touch on the cards? Download now and don't forget to rate. - Fixed bugs with sync in Android O and above. - Fixed bugs with Google Authentication. - Fixed bug in "Reminders". 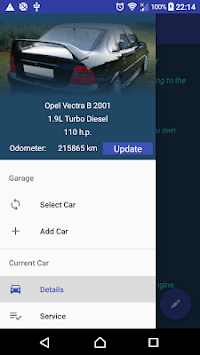 - Fixed bug in "Parts"